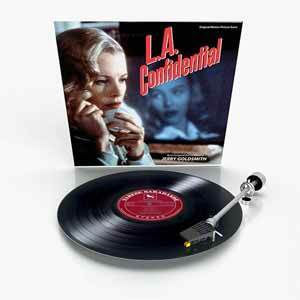 Jerry Goldsmith gives us a dark and moody noir-esque jazz score for L.A. Confidential. If I had to describe it to someone who hadn't heard it, but were au fait with Goldsmith's style, I'd have to compare it to his score for Rambo. There are a lot of similar motifs, and L.A. Confidential ends up sounding like a jazzy Rambo. The 11 tracks come in at 30 min, 02 sec and if you're a Goldsmith fan you'll need to add this to your collection. It's a little different to what the composer normally delivered and that makes it all the more interesting. With only 500 editions manufactured, soundtrack collectors should get their skates on.